Toilet seats have long joined the trend of fashionable items needed to make our homes unique. It is now the thing to have more than one toilet in apartments these days. It is not unusual to have as many bathrooms as there are rooms including one for guests. And don’t be surprised to discover each of these bathrooms having a unique decorative design. In other words, the days of plan white commodes are long gone. Deciding to install toilet seats can be daunting given the variety available to buyers. This becomes even more difficult if you have no idea of what you want as far as color and design are concerned. 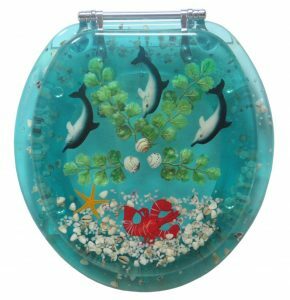 10 Beautifully Designed, Fancy and Unique Toilet Seat. Like the name suggests, it is made from polyresin material. Polyresin is known for being sturdy which is why it is the material of choice in making statues and decorative furniture. The stain-resistant product features aqua green dolphins, sea plants and weeds, shells, and a red lobster all on a background of ocean blue. Corrosion-proof and easy to install, it also comes with strong stainless steel hinges to ensure durability. Easy to clean, and can also be removed easily if the plan is to get a replacement seat down the line. However, some might find it a tad too small relative to standard sizes. And some users complained they had to buy the nuts, and washers needed for installation. 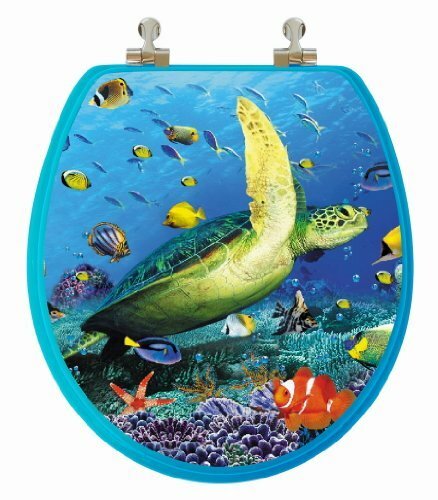 If raving about a toilet seat can be a bit silly, the Topseat 3D Ocean Series is one that’d make you embrace silliness. You could make it habit to slip in a word or two about it anytime you are with friends. It is so beautiful you can’t help yourself talking about it. Made from wood, it is hand-sanded making the surface thoroughly smooth. The ocean blue finish and gloss adds to the sleek and sophisticated appearance. The hinges are metallic with chromium varnish. This would match perfectly with most fixtures in the bathroom as well as ensuring the durability of the appliance. The design of the toilet cover is an amazing piece of art with great attention to detail. It is of a sea turtle swimming serenely in a life-like ocean habitat complete with other species of fishes. It would have been perfect but for one or two defects related to its functionality. For instance, you would need to buy and use very heavy washers during installation to ensure the stability of the seat. 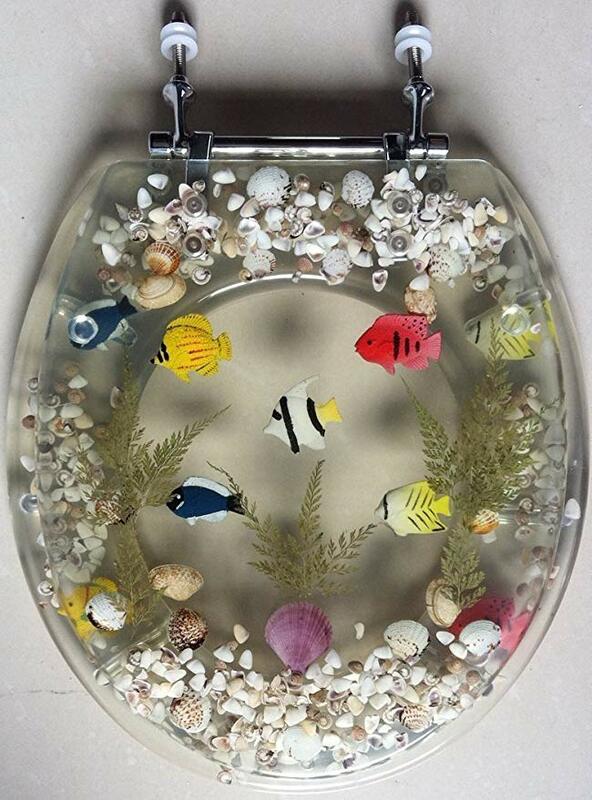 The Transparent Fish Aquarium toilet seat is a resin-made toilet accessory that is unique in design and functionality. Comfort and durability were given priority in the making of the ergonomic toilet seat. 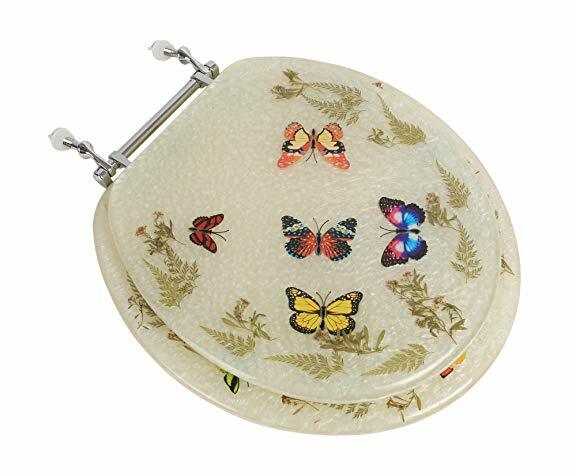 Designed mainly for use with round toilet bowls, it comes with strong metal hinges for durability and stability during use. It is designed with a blend of colors to give that classic aquarium appearance. And to ensure the colors don’t fade easily, each seat comes with ultra-violet light protection. It is easy to install and is good value for money. And you won’t find it hard to clean and keep spotless saving you a lot of stress. The makers of this product could be accused of taking on too much and forgetting the little details that matter. 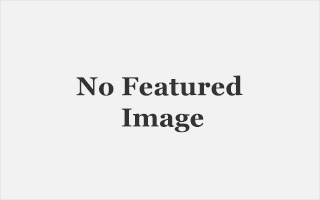 For instance, the metal washers tend to come loose often requiring that you have to tighten it from time to time or it becomes wobbly and unstable. And it seems there was a rush to attach the six supports at the bottom of the seat. Many users complain they are not uniformly spaced. Made from quality resin, though transparent, the special resin material used in manufacture makes it surprisingly strong which means it can stand a lot of stress and pressure without coming apart. The durability of the toilet seat is enhanced by the metal hinges which also double as a stabilizer when it is properly installed. Installation though is easy with the right washers, nuts, and bolts. A standout feature of this toilet seat is the ‘slow close’ lid. This is the function of the pneumatic hinges that makes it impossible for the lid to be slammed on the seat. The transparent lid is beautifully designed with sea blue color. The two fishes, white pebbles, different colors of shells and vegetation drawn on the lid give the appearance of a beautiful underwater world. The original colors are protected from fading over time with ultra-violet additives. Before you purchase this product, make sure the dimensions match your bowl as seats suitable for oblong toilets are not available. It comes in two shapes/sizes combination to give users better options. You can order the 17” round seat or a 19″ oval elongated shape depending on the shape of your toilet bowl. Though acrylic is part of the name of this product, it is actually a resin-acrylic combination to ensure durability and sturdiness. 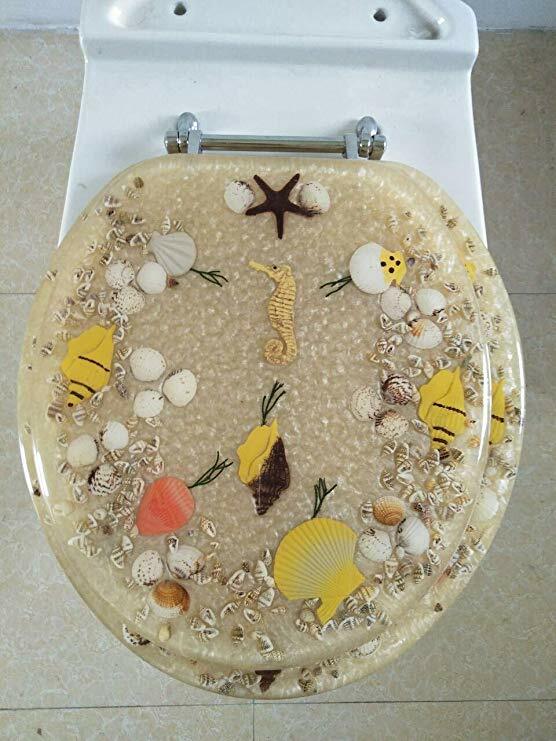 The design itself is more of beige with life-like seashells and seahorse embedded on the lid. The whole appearance is of an undisturbed sea bottom near an uninhabited Pacific Island. For increased durability and stability, the toilet seat comes pre-installed with metal hinges and bumpers. All you would need to install it is a pair of pliers and wrench with the right nuts and washers you can get easily from any hardware store. And to ensure the colors don’t fade over time, ultra-violet protection is molded into each seat. One noticeable downside is the placing or positioning of the nuts in the package. They are concealed in a small bag in the foam wrapping. Because they are hard to find, many people assume there are no nuts. And to make it worse, getting new nuts can be difficult because the size that fits the hinges is not very common. You have the option of choosing from any number of designs and colors. They are easy to install and made from molded wood. A unique feature of the toilet seats is that they are adjustable. What this means is they can be adjusted to fit all toilet bowl sizes from 15.3 inches to 17.5 inches. The metal hinges are strong to ensure stability and durability of the bowl. The hinges were designed to make the seat a slow closing lid. So, people who love slamming toilets lids close would have no joy with it. Slow close lids also add to the durability of the seats because slamming is known to cause stress fractures in toilet seats. With its smooth glossy finishing, it is also easy to clean. Beware though, if you are not handy with tools, you would find the installation rather difficult even with the detailed installation manual that comes with it. And the seat never stays up unless you hold it up with your hand, which can be awkward for men prefer urinating with the seat up. 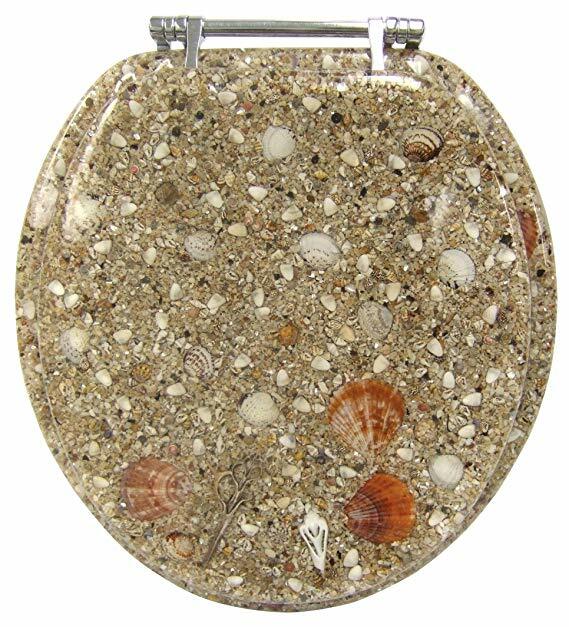 The sea isle theme would be perfect for a bathroom decor with a beach or coastal theme. 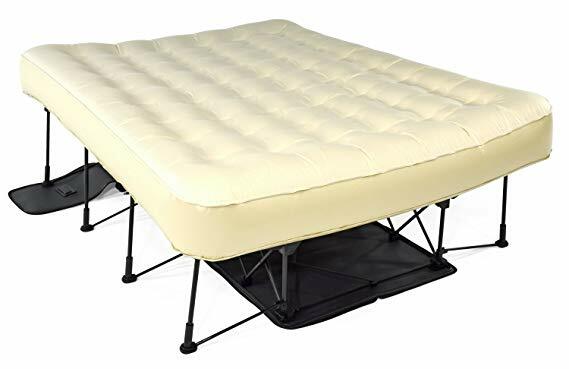 The seat comes with a weighted resin base to ensure balance and stability. Add the heavy-duty metal hinges and you get a toilet seat built to withstand stress over a long period of time. It is easy to install with a net result of zero-wiggling which translates into a product that is stable and durable. It measures about 16.5″ long making it a standard toilet seat. As a result, it would fit perfectly in almost all standard toilet bowls. The artwork on the lid is evocative of a sun-drenched Caribbean beach. 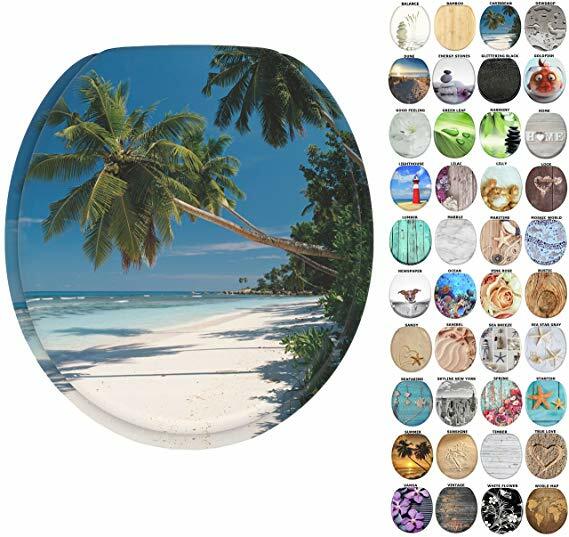 The seashells, sand, pebbles and stones artworks capture the tropical feeling perfectly. Though great to look at, it is not perfect which is rather unfortunate. You might find the supports under the seat too high and far apart. This could easily lend it to cracking when a normal sized adult sits on it. It is uniquely made from 100% duroplast. It is a resin plastic that is reinforced with high-grade fibers making it a rather strong. Consequently, it would be able to withstand the weight of an average adult without cracking. The material also ensures it is resistant to chipping and peeling. Also, it doesn’t fade or stain easily. 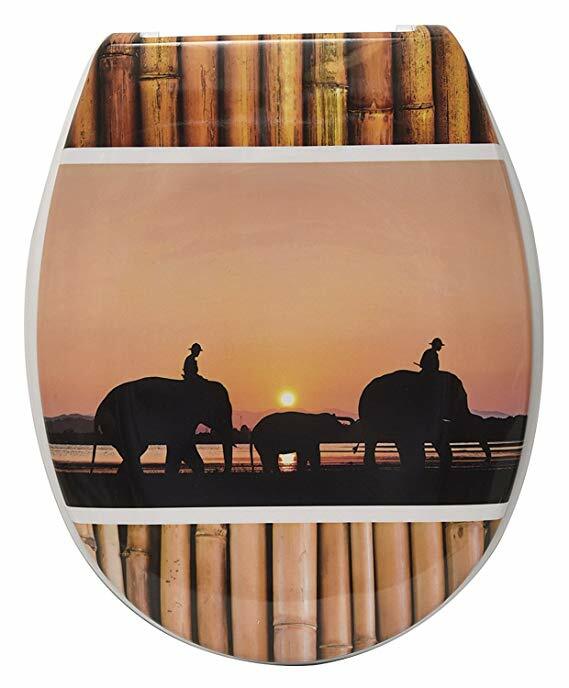 If you like adventure themes, the cool sunset elephant ride art decor would certainly appeal to you. And you can choose between brown and beige colors. The seat is comfortable and is supported by four 4 bumpers making sitting on it a real pleasure. Cleaning doesn’t require purchasing expensive cleaning fluids. Warm water and soap would leave the seat looking sparkly clean and pristine. It is easy to install with mental adjustable hinges. The hardware necessary for installation is included in the package so you don’t have to make an extra purchase from a hardware store. Adjusting the hinges shouldn’t be a problem. Twisting the hinges can adjust the length of the toilet seat between 17 and 17.95 inches. However, if your toilet bowl is round, you would have to look elsewhere for a decorative toilet seat. It is only for elongated oval bowls. This is such a shame as the artwork is so cool. This product maximizes the full potential of acrylic and aquarium color. 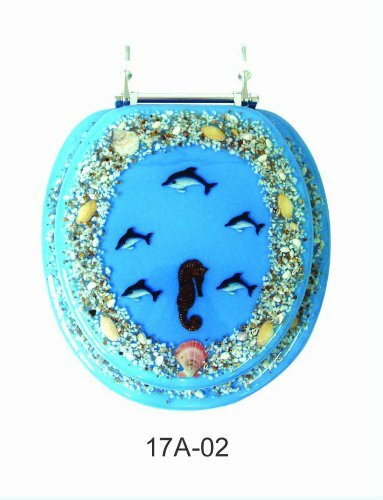 Added with the fishes, shells and other forms of marine life on it, what you get is an aesthetically pleasing toilet accessory for your bathroom. 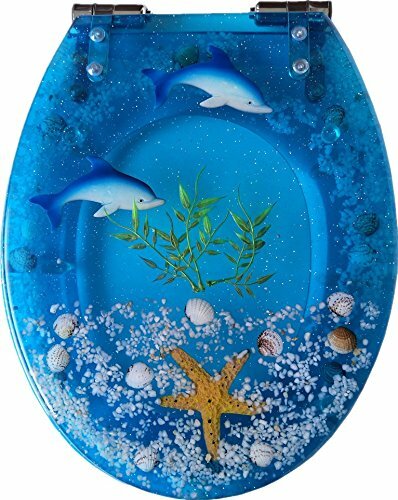 Though the shells and the fishes are not real, they look so life-like that at first glance, one would be tempted to believe it is a real underwater world on a toilet bowl. Made from crystal clear acrylic. This is a type of plastic material famous for its resistance to breakage. This is the minimum standard required for any good decorative toilet seat. Nobody wants to be wasting money buying replacement seats often. The hinge is made of stainless steel. This complements the sleek appearance of the toilet seat. Also, the use of stainless steel material to make the hinges means you get a durable product that doesn’t break down or corrode easily. Easy to install, it comes with four bumpers evenly placed on the underside of the seat to ensure stability. This added stability means loosening or damage of the product after some time is minimized. It is corrosion-resistant, stain-proof and easy to clean. A couple of downsides are immediately clear about this product. First is the fact that it comes in just one style. It would fit only round toilet bowls. Secondly, if your toilet bowl is larger or significantly smaller than 17.5″, it won’t align with the toilet seat the way you’d love it. It has an understated elegance that immediately confers class to your bathroom. The strong plastic material is multi-coated with polyresin to provide a long-lasting beauty that won’t fade anytime soon. The lid itself is designed with beautiful seashells and plants embedded in it on a pearly white surface. A multi-coat finish of the seat ensures the overall design doesn’t fade away for a long time. 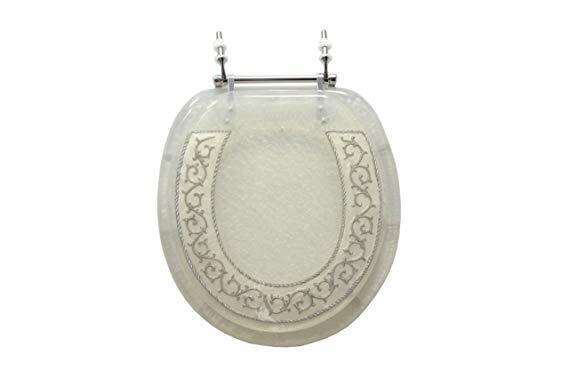 In the tradition of the best decorative toilet seats, the hinges are made of stainless steel to ensure durability, stability and eliminate rust. Perfect alignment with the toilet bowl can be achieved easily as it is easy to install. A wrench and a pair of pliers are enough for the installation. And as an added bonus, the hinge design ensures the lid closes down slowly eliminating slamming which also adds to it’s durability. It is corrosion-proof and resistant to stain which makes cleaning an easy task. Sadly it doesn’t come with nuts to bolt down the seat to the bowl. So you would have to go and purchase it. And getting the right sizes might prove a bit difficult. The type of design would have a direct influence on the cost though. So don’t be surprised if an elaborately designed seems a bit pricier. Some of the designs could be artwork done by professionals. Others though are basic drawings depicting a scene or simply a mix-mash of cool colors. The most popular themes are of a beach scene, aquatic habitat or fish tanks. But you don’t have to restrict yourself to these two. Most are made from plastics and with good reason too. Plastics tend to be cheaper and don’t break easily. So if you are looking for durability, a plastic is the best option. The other material is ceramic and wood. Ceramics can be very beautiful. The downside though is that they break or crack easily and are more expensive than plastic. Wooden variations are made from compressed wood material are also an option. The major advantage of wooden seats is you can paint it over and customize them with colors that match the decor of the bathroom. However, they break easily compared to plastics. Also, the likelihood of splinters in wood is a factor that makes them not such a great choice. Like regular toilet seats, the shape is important too. There are two basic shapes: round and elongated/oval. This variable is very important if a replacement is what you want. The shape of the new one must match the shape of the toilet bowl. For new apartments with tiny toilets, a round seat is recommended because they don’t take up much space. However, if your bathroom is big, it won’t really matter if it is elongated or round. The durability can be determined by the type and quality of hinges used. Plastic hinges are less expensive but due to the plastic material, flex easily from side to side during use. The hinges might suddenly snap in two after some time due to this. High-quality hinges use metals and are pneumatically controlled. This ensures there is no side to side flexing and the lid of the toilet never slams down on the seat section. This prolongs the life of your toilet seat. Padding is mostly about how comfortable you want to be while doing your business in the toilet. Here is the thing though, padded seats though comfortable to sit on, add an extra layer of maintenance in the long run. You’d have to deal with degraded foam pads and split vinyl or cracked cores sooner than you wished.